Szabla, R.; Šponer, J.; Góra, R. W. J. Phys. Chem. Lett. 2015, 6, 1467-1471. For decades, it has been well known that solvents, especially polar ones, have a large impact on the photodynamics of chromophores. Phenomenological models, such as the Lim Proximity effect (1), for instance, have been developed to describe how the energy shift caused by the solvent molecules determines radiative and non-radiative rates. These early approaches focused mostly on the description of the shape of the potential energy surfaces and on the relative shift between them. From that tradition, we learned, for example, the important heuristic rule telling that, in comparison to the gas phase, water stabilizes the ππ* state of the chromophore, while it destabilizes the nπ* state. Those models, however, did not consider that new electronic states arising from the chromophore-solvent interaction could play a major role in the fate of the excited system. From the photochemical point of view, the solvent was understood as an important but passive factor. Many simulations relied on this important-but-passive hypothesis, to restrict, for instance, the quantum-mechanical region in QM/MM modelling to the chromophore only, saving precious computational time. The paper by Szabla, Šponer, and Góra (4) belongs to this new tradition, the important-and-active hypothesis. 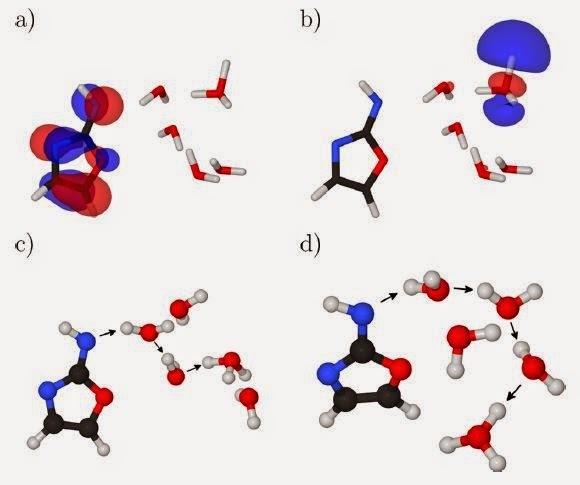 Using surface hopping simulations based on ADC(2) excited states, they investigated the ultrafast dynamics of 2-aminooxazole (AMOX) microsolvated by water. They found out that an important radiationless pathway for the AMOX-(H2O)5 cluster involves an electron-driven proton transfer along water wires. This process occurs in an electronic state characterized by an electron transfer from an n orbital at the chromophore to a σ* orbital in one of the water molecules (Fig. 1). Fig. 1 - Electron-driven proton transfer along water wires. Szabla, Šponer, and Góra note that similar deactivation mechanism has been observed before in simulations of other heterocyclic chromophores. This means that it may be a common pattern in the photochemistry of these compounds. Although this is is matter for speculation, all these examples imply that we cannot restrict ourselves to credit polar solvents a passive role only. Any new investigation, either experimental or theoretical, has now to take into account the possibility that the solvent may actively be contributing to the photochemistry. In particular, for the next generation of excited-state QM/MM simulations, the message (and the cost) is clear: quantum-mechanical microsolvation is simply mandatory.